Eco-Screen Partitions are designed to meet the most demanding of applications. The basis of that design incorporates PaperStone as the panel material. PaperStone is manufactured in 60” x 144” panels and every partition system produced is custom manufactured and is easily customizable. To assist in the budgetary process however, Eco-Screen is available in 3 basic design concepts. BASIC: The Basic series incorporates 1/2” material for dividing panels, 3/4” for doors and pilasters and uses an aluminum head-rail as its over head support. It affords all of the performance, durability and sustainable attributes of Eco-Screen while extending an entry level price point. INTERMEDIATE: The Intermediate series incorporates 3/4” for all PaperStone components and is available with either an aluminum or PaperStone head-rail. The Intermediate series extends to the decision maker a number of options including the addition of radiuses to the top of doors, panels and even head-rails. These custom options turn a typical utilitarian application into a restroom with attractive, furniture-like, inviting privacy compartments. ADVANCED: The Advanced series extends the design canvas entirely to the design professional. PaperStone is a time tested, durable and sustainable component of the Eco-Screen brand. Other materials however can be incorporated as accents or functional components such as the doors. Corporate logos, promotional material of just “fun” designs can be routed into the material and left as shadow images or back painted in a contrasting color to provide extra accent. Any digital image can be printed on the PaperStone in full color using technology designed to withstand the harshest of signage applications. 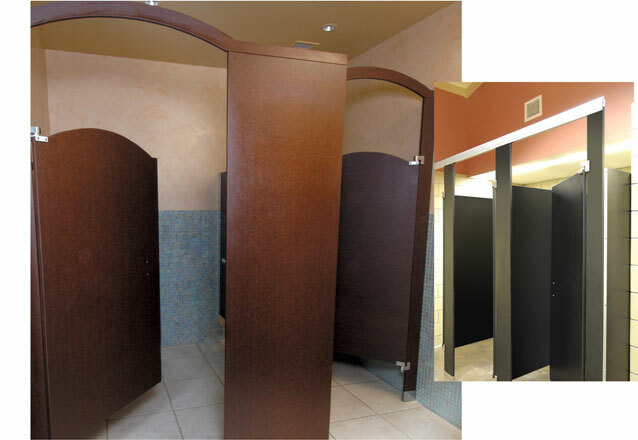 Express your creativity and provide the property in question with a one of kind restroom.